Welcome to Cooking With Cricut's Cartridge Showcase. 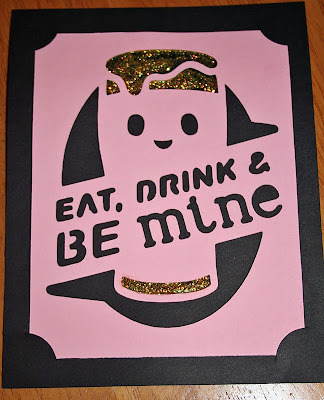 Chef Debbie has taken over the blog today is sharing with you some beautiful projects she has made with Cricut's Spring Holiday Cards cartridge. Create cards, envelopes, and boxes with the Spring Holiday Cards cartridge. 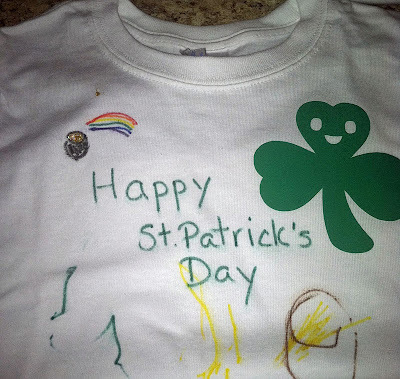 This festive cartridge contains images for Valentine's Day, St. Patrick's Day, and Easter. Mix and match card fronts with backgrounds to create fun variations on your projects. 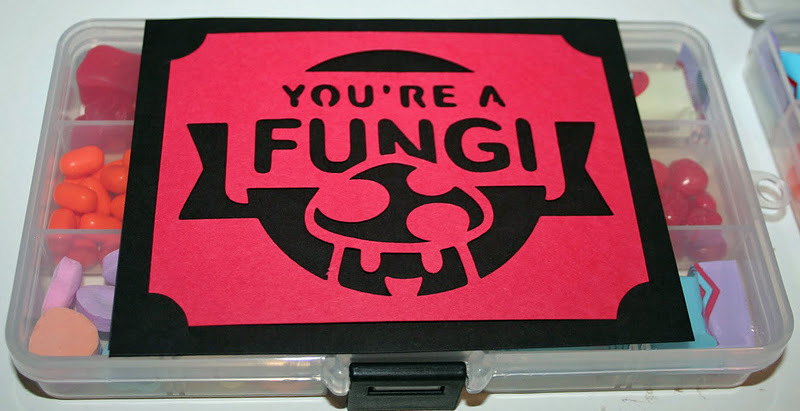 Use this cartridge to create unique and engaging designs for every occasion. The versatility of this cartridge will surprise even the most imaginative crafters. Includes cuts for 30 spring themed cards as well as envelopes and boxes. I purchased this cartridge last Spring on a whim when I just happened to see it at Michaels on sale. I have used it several times since then and it has only been Spring once, LOL. My most recent project is using one of the treat boxes and a card that I altered in Cricut CraftRoom. I bought my friend an iRock and some gems as a thank you gift (she is loaning my son her son's lacrosse gear which is saving me at least $300). The iRock itself will not fit in the box but the pack of gems and a few pieces of dark chocolate candy (her favorite) will fit perfectly! I cut the box (the very last box on the cartridge) at "fit to page." 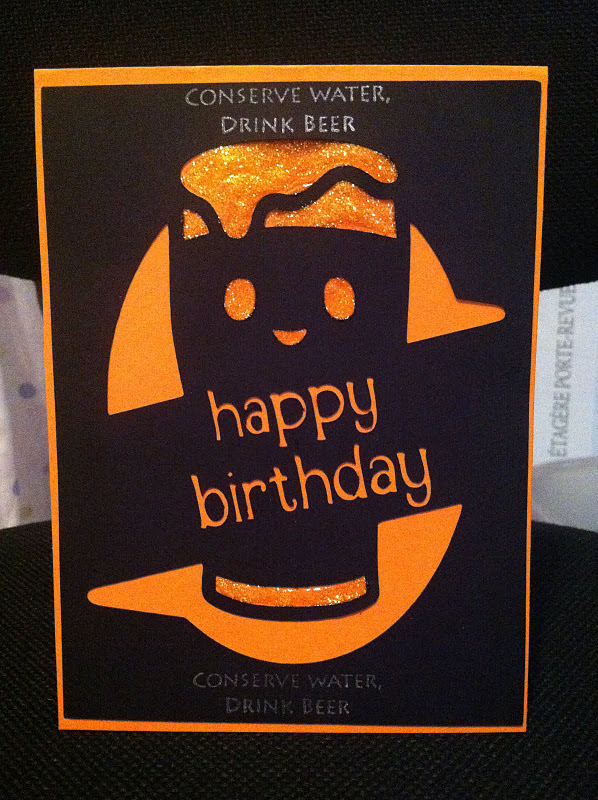 I then took the card and took out the words using hide contour and then cut the card at 4.1 x 3.1. 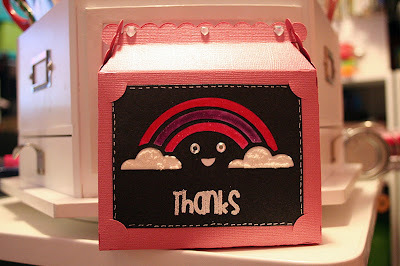 I stamped "Thanks" using my Big Thoughts stamp set from Pink By Design with Versamark and embossed it. 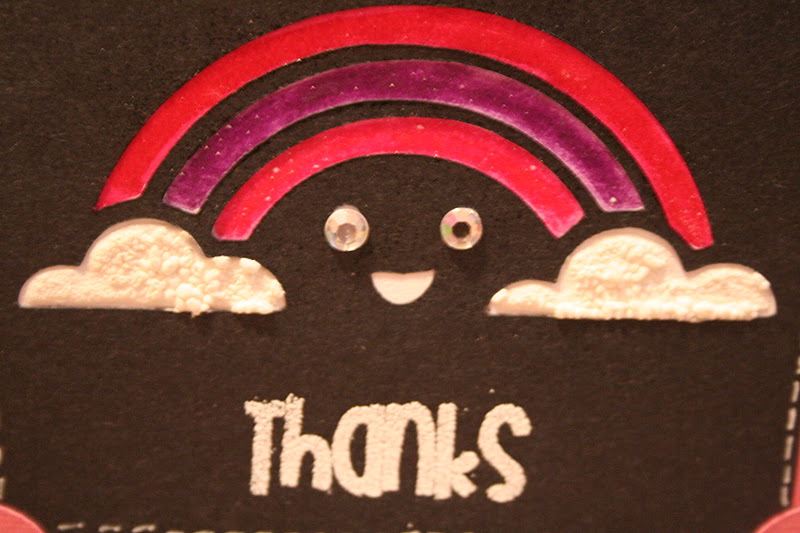 Then I cut a white piece of paper to fit behind the rainbow. I glued it on and then used my snow writer pen to make the clouds. I could not decide what to do with the rainbow so I just decided to color and go for a faded look, I did try to emboss the rainbow but it did not turn out that well using marker, I will have to experiment with that a little before trying that again. I added some white stitching with my gelly roll pen and some bling for the eyes. Lastly, I added a few blingy hearts along the top of the box (oh and I put the gems and candy inside). Since my husband loves beer, and I got him a beer of the month club membership, I used the card on this cartridge that has a beer on it. I have used it on several occasions, usually altering it for the occasion. I did this one using a Pink By Design stamp for his birthday card. Here is a picture and here is where you can find the original post. 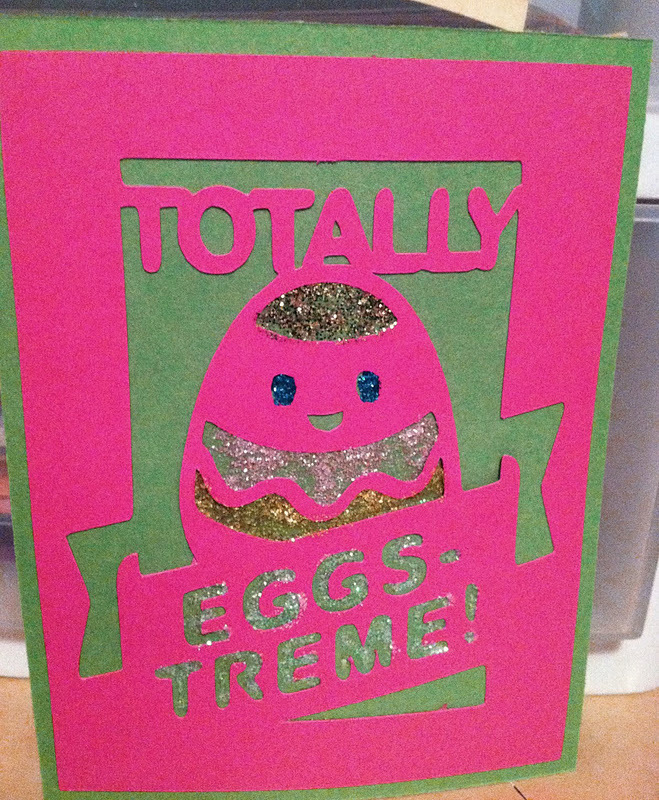 I also used this cartridge last Spring for an Easter egg hunt/party invitation. I made invitations for the neighborhood kids, the picture looks like they were green and red but they were a nice spring green and pink. I printed the invitation details on the green paper then attached the pink paper on the other side and stickled it up. The entire post can be found here. The post on these cards and other St. Patty’s Day goodies can be found here. 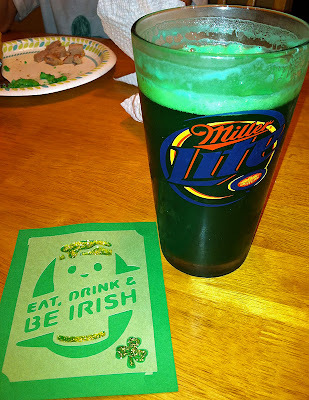 I actually ended up doing two St. Patty’s days posts last year, LOL. I used the cartridge to cut the cute Shamrock’s using my Imagine (so I could flood fill it green) and ironed them onto t-shirts for my girls. Here is one of the shirts and here is where you can find the post. 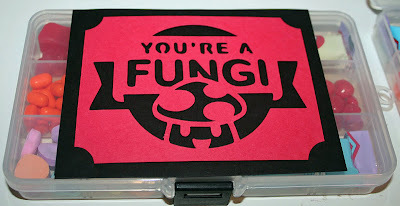 Lastly, I used this cartridge for Valentine’s Day last year (and plan to use it again this year!). 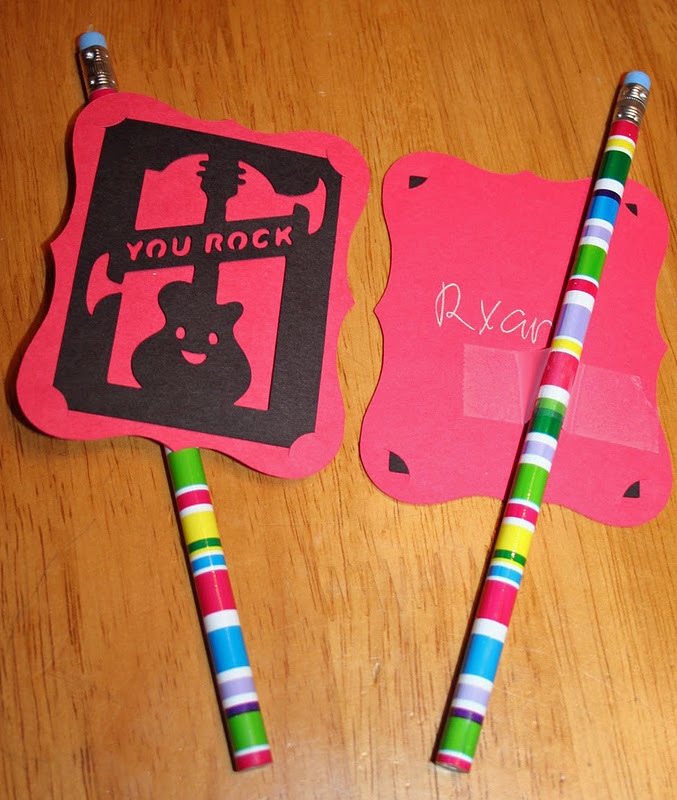 I used it to cut the little cards that my boys gave out (simple and just attached a pencil), I also used it for the little containers I made for my kids. 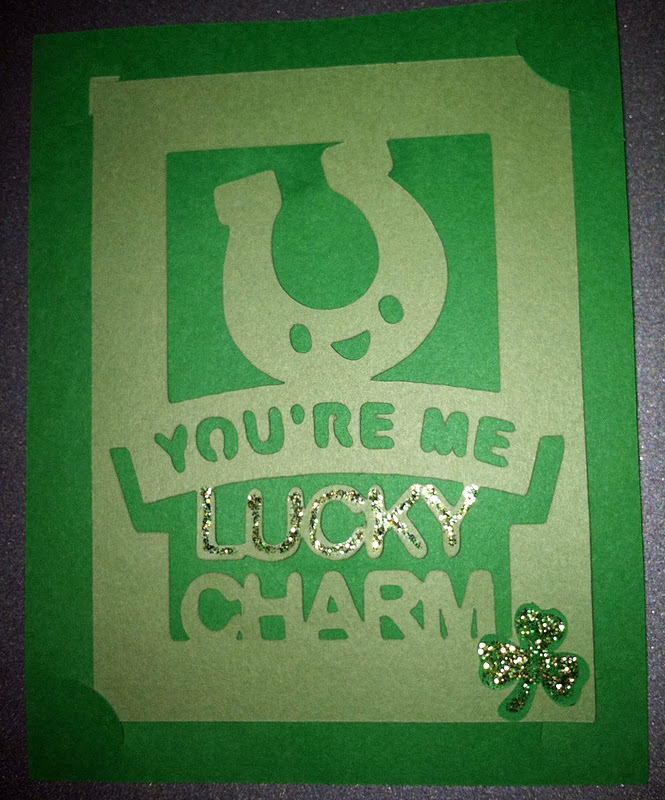 I also used it for the card I altered and gave to my husband. Here are some pics and here is where you can find the original post. Great projects, Debbie! Please make sure you stop over at Debbie's blog and let her know how much you enjoyed her Cartridge Showcase! Make sure you stop back in at CookingWithCricut.com on Wednesday for our weekly challenge and on Thursday for Chef Jill's cartridge showcase. Have a great week! WOW Debbie, Thank you for sharing such a wonderful variety of projects from this one cartridge. I really need to get mine out and do something with it!!! Thank you for a great showcase! These are so fun, Debbie!! What a great bunch of projects, really love the rainbow! !